Weight gain is normally a result of taking in more calories than are burned, so losing weight often takes a bit of effort to make tweaks to diet and exercise habits. Many people are aware of the risks to physical and mental health that excess weight can cause - such as depression, high blood pressure, and higher risk of diabetes - but are still reluctant to put in what is required to lose weight due to work pressure or lack of motivation. Keep reading to overcome these obstacles. Dancing is a fun way to lose weight that can be used as a social activity with friends or with a partner. There are many different styles to choose from, and the sense of achievement that arises from learning a new skill will give an extra boost of energy and motivation. Look out for local classes and choose a dance style to suit you. Hula hooping is a physically intensive activity and can be difficult, but you will work up a sweat, and it can be great fun to try with a friend. However, if this proves too embarrassing, you can also practice in the privacy of your home. Beginners will find weighted hoops easier, but once you have improved, a lighter hoop will help burn more calories. It is a fun way to lose weight if you do it to some music, and it's suitable for all age groups. This might involve an initial investment in the inline skates, but this can be worth it to reach your weight loss goal. It is perhaps more commonly associated with children and teenagers, but there is no reason why adults can't give it a go, too. It has far less impact on your joints than running, so it might be good for people with problems in those areas. 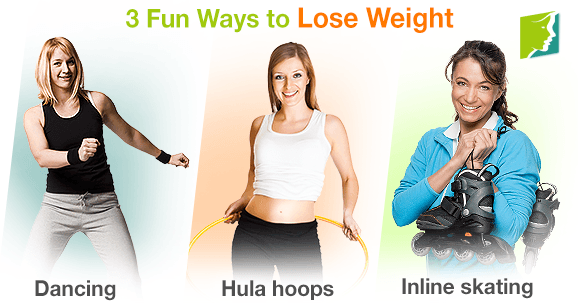 There are, of course, many other fun ways to lose weight. In fact, any activity that does not involve sitting or standing can help towards your weight loss goal. The general message is, instead of forcing yourself to get into a routine that you hate and thus will not be sustainable, see the fun activities as of equal worth. Have fun, and you are more likely to lose weight.